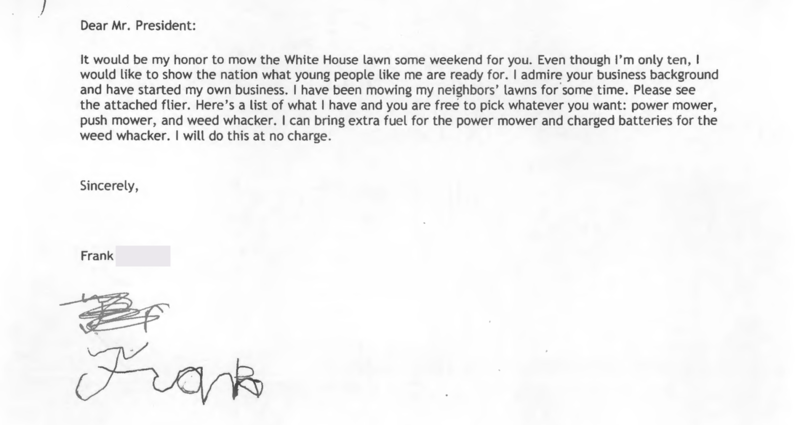 He's 11, A Business Owner And Just Landed The World's Most Famous Client The White House continues its letters-from-forgotten-people series with a business opportunity from 11-year-old local entrepreneur. Say hello to my new friend Frank. He's an eleven-year-old biz whiz kid whose career in landscaping is about to take off. A week ago Wednesday, White House press secretary Sarah Huckabee Sanders promised anyone tuning in to the daily press briefings they'd be treated to personal letters from the "forgotten men, women and children that we're here to serve and the president is fighting for." At which point, the public was introduced to an inquisitive 9-year-old-boy named Dylan "Pickle" Harbin. Wednesday there was Frank from Falls Church, Va., who, according to Sanders, "embodies the enterprising and ambitious spirit of America." The selection of Frank's letter is a nod to the administration's messaging effort this week (which has been dubbed "American Dream Week" by the White House). Frank runs his own small business. His assets include a push mower, a power mower and a weed whacker. And, like Pickle, this self-starter is also an admirer of President Trump's business acumen. Frank, who seems to have taken a page out of a "How to Grow Your Business" manual, was savvy enough to include a flier for his start-up as well as a list of services. "You're free to pick whatever you want," he encouraged Trump. To entice the president further, Frank threw in the bonus of free fuel should Trump choose the power mower package. "I will do this at no charge," he generously wrote. The letter is only the second in what the White House has said will be an ongoing feature of the briefings, but it is an indication of an intentional shift in tone that started last week as Sanders replaced Sean Spicer behind the podium. Presumably, it is an attempt to humanize the president, his surrogates and his policies during a period of chaos and public infighting. It is not unusual for presidents to read letters from and correspond with the citizenry. It was a daily ritual for President Obama, who, starting on his second day in office, read a sampling of 10 unvetted letters. He considered them among his most important daily reading materials, the Washington Post reported back in 2010. Obama publicly joked that some who took the time to write called him "an idiot," but he said they provided an important glimpse of the world outside the "presidential bubble." As for Frank, he's getting his wish. President Trump invited the entrepreneur to spend a morning with the groundskeeper to learn how the U.S. Park Service maintains the 18 acres of the White House. "He'd love to give you the opportunity to cut the grass in the Rose Garden," Sanders said at Wednesday's televised press briefing. That would be really impressive on a flier don't you think? 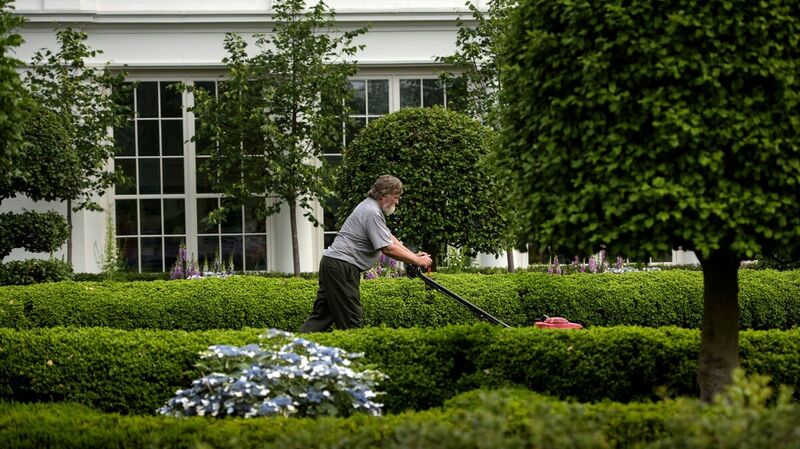 A groundskeeper cuts grass near the East Wing of the White House on May 31, 2016. P.S. — Please direct all fan letters praising Frank, lamentations about your own professional inadequacies, or requests for landscaping job quotes to the White House.